Tim grew up in Albury, Australia, where he played Australian Rules Football (AFL). He stumbled across triathlon during the off-season when he and some of his teammates decided to do triathlon to keep fit. He entered his first triathlon at age 18, and three years later was racing as a professional. Since then, Tim has become the world's youngest three time Ironman-distance winner in the 35-year history of Ironman racing. 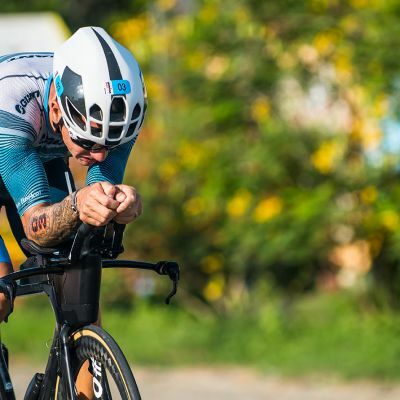 He also won the 2012 Australian 70.3 Ironman Championship and last year finished seventh at the Ironman World Championships in Hawaii his first time entering the event. The 2015 season was Tim's first as a Giant global athlete. He helped develop the new Trinity Advanced Pro bike and plays a key role in working with Giant to develop triathlon-specific gear and apparel. Giant is also Tim's official helmet sponsor, and he uses the Rivet TT helmet for Ironman races. Quote "The man who wins is the man who thinks he can." VAN BERKEL, IRONMAN 70.3 DAVAO에서 포디엄 피니시를 기록하다! BERKEL, IRONMAN 70.3 GEELONG에서 포디엄을 향해 질주하다! VAN BERKEL, IRONMAN WORLDS에서 강력한 퍼포먼스를 발휘하다.